Unfortunately, there isn’t a standard one solution fix-all for setting up a home office. Since every home and every individual is unique, so to is every home office. Your home office should largely be a reflection of you and how you work best, but here I’ve listed a few general ways to optimize productivity and manage your time more effectively. Find a room, corner, nook or niche that is clean and where you will not mind spending a lot of time. Trying to turn your unfinished basement, which contains everything from a weight bench to old Christmas decorations, into a home office is probably not going to be the best place to get you pumped about working. You need a space that is clean and neat and inspiring. If you have to step over or clear away clutter before you can begin working, your productivity has already taken a hit before you’ve even begun to work. Organization is key when working from a home office. I cannot express how important it is to have a designated place for everything when trying to maintain an organized space. Many people make the mistake of sticking a desk and a chair in a space and not giving any consideration to the other factors that make up an office, like shelving, file cabinets, bins, drawers, etc. Consider how you work. Do you use a lot of files? Notebooks? Does your job require that you keep hardware or gadgets on hand? If so, take an accurate count of the number of files, notebooks, hardware or gadgets you need for any one week. Keep these items closest to you and within arms reach. Other items that you don’t use as often can be stored at a distance. Make sure everything is labeled and grouped together in like clusters. When similar things are kept together, it makes organization and clean up easier. Some people need only a laptop to work. While others require printers, multiple monitors, hard-drives, speakers and a host of other equipment, with each piece having its own cord, or two. I mentioned labeling, previously, as it related to files and storage solutions, but it can also make life easier to label and tag your cords. Should a piece of equipment need to be disconnected and serviced or swapped out, not having your cords labeled can make a simple task time consuming and frustrating. There are many easy do-it-yourself life hacks that can be found from a simple Google search of “labeling equipment cords” or you can purchase cord identifiers from your local office supply store. 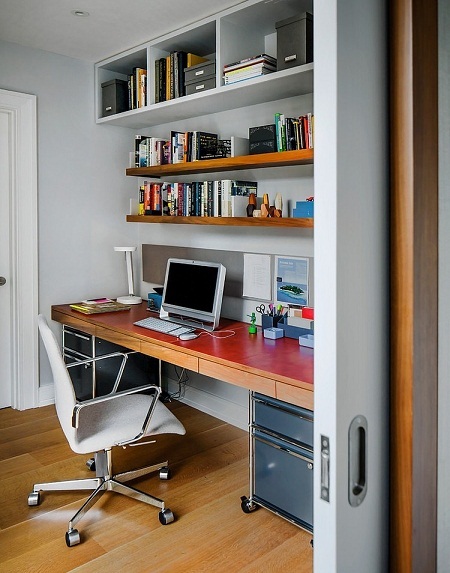 Now that you’ve found a space for your home office and you’ve equipped it with the necessary storage and organization tools to successfully and efficiently work from home, you should make sure that you have a comfortable place to sit. Invest in a chair that boasts some ergonomic benefits. The chair seat should be at a comfortable height and width and have sufficient padding to accommodate sitting for long periods. Lumbar or back support is also important when selecting a desk chair. There is not much worse than having to sit in an uncomfortable chair for extended periods of time. If your desk chair is uncomfortable, it can become a distraction from the work at hand. Even if you’re work involves something you love, some days finding inspiration can be difficult. Painting your home office a hue that is invigorating and refreshing can help to recharge and stimulate your senses. Hanging art, motivational quotes or family pictures in your home office can speak to you and remind you of the big picture, i.e. why you are doing the work you are doing. Include any awards and recognitions in your office, as well. They will serve as an incentive to stay focused, to clear away distractions, and to get the job done. Finding and managing productivity is unique for each person. While these tips should help, the most important thing you can do is be intentional about what you want to accomplish in your home office. Consider what you need to do your job effectively and establish a home office that meets those needs. Tags: Best & Company, Chelle Albert Interiors, DeChelle Harris, Noe Todorovich Photography. Bookmark the permalink.